Carnival Malta is synonymous with 5 days of complete madness, bright colours, competitions, events and fun. Carnival is celebrated right before the start of Lent. It starts off on a Friday and goes on till Tuesday, before Ash Wednesday. 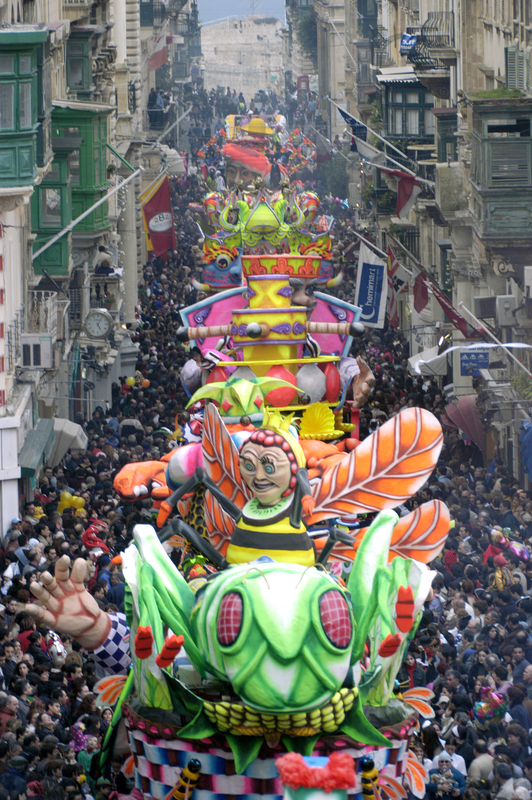 Malta Carnival 2019 will be celebrated between the 1st and the 5th of March 2019, the festivities always take place 7 weeks before Easter Sunday and children have a couple of days off from school as most families head for Valletta which bursts with parades, music, floats and people in costumes. Carnival celebration in Malta can be tracked back to the 1400s. The Knights of the Order of St. John celebrated Carnival in grand style and introduced strength competitions and carnival balls to Maltese traditions. The tradition of Carnival survived throughout all these centuries. Nowadays, Carnival is marked by a competition of colourful, gigantic floats accompanied by parades of dancers dressed up in grotesque masks and costumes. The main parades are held in Valletta and Floriana. Carnival balls and parties are organised in various localities around Malta and Gozo. For 5 days in a year, anyone can dress up, cover his face with a mask and fool around the streets. Many young people gather in Nadur ( a small village in Gozo) during the weekend. Carnival in Nadur takes on a different aspect of merriment from the one celebrated in Valletta. Carnival in Nadur is not televised and religious institutions often protest about the events that take place in this small village. However, Carnival in Nadur is not organised by any committee but is just a spontaneous gathering of people. The Maltese take up any valid excuse to indulge in food, and associate particular food with yearly traditional events. A visit to Valletta or to any confectionery in Malta during Carnival will introduce you to the traditional 'Prinjolata'. This is a special cake, in the form of a bell made up of sponge, cake, almonds and eggs. This is then coated with meringue and decorated with chocolate and cherries. Prinjolatas are usually very big and are then sold by weight from street vendors, but one can also buy mini sized prinjolatas as a souvenir. All around the Maltese Islands there are various balls and many of the Villages have their own carnival celebrations.